Emirates serves more than 100 million meals a year with the same attention to detail in First, Business and Economy Class. 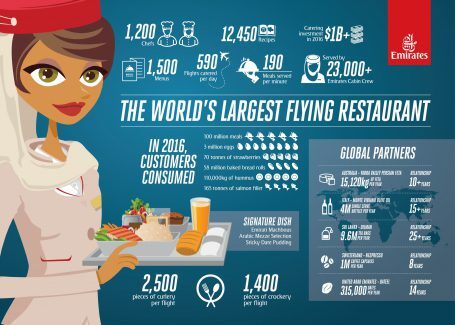 Catering for more than 55 million dine-in guests a year travelling to and from 144 cities across 6 continents, no one understands global culinary trends better than Emirates as it serves destination-inspired cuisine onboard the world’s largest flying restaurant. With a catering investment of US$1 billion per year, Emirates runs a round-the-clock kitchen with 1,200 chefs based in Dubai whipping up 12,450 recipes. The finely-tuned operation caters 590 flights a day with authentic local cuisines giving customers a taste of the destination they are going to. The airline also works closely with 25 catering partners around the world to provide the same quality of food for its Dubai-bound flights. Emirates’ focus on local flavour means it has food available from every region it flies to. Flights to Japan for example, offer authentic Kaiseki cuisine and Bento boxes served with Japanese crockery, cutlery and tea sets to ensure an unrivalled food experience on board. The airline recently launched a new menu for its Australian routes inspired by the breadth of the country’s multicultural flavours and cuisines, after a 14-month process working in consultation with local chefs. The new menu features a broad range of traditional local favourites such as minted lamb sausages. Reflecting Australia’s multiculturalism, the menu also includes Asian flavours, as well as Middle Eastern flavours and ingredients, catering to Emirates’ diverse passenger mix and representing its global route network. The varied menus on each route are also reflected in the bread baskets served on board. Flavoured breads or breads produced with a sourdough base are popular on European routes while parathas, pooris, and naan bread are served on all nine Emirates routes to India. On its Middle Eastern routes, customers get to enjoy Arabic bread – Markook – a very thin unleavened bread common in the region, and Manakesh which is either topped with Zaatar or Cheese. Emirates focuses on simple, well cooked dishes that emphasise fresh ingredients of the highest quality. The airline brings the finest products on board through long standing partnerships worldwide, and supporting local suppliers and artisans. This includes sourcing over 15,000 kilograms of Persian feta from the Yarra Valley in Australia each year. The olive oil served on board is exclusively from carbon neutral producer Monte Vibiano in Italy, a partnership that is now more than 15 years old. Like any star-rated restaurant, Emirates pays special attention to its wine lists, boasting world class champagne and wines. The wines on each route are carefully selected to complement the menu and include exclusives found only on Emirates such as the Dom Pérignon 2005 Rosé champagne and 1963 Graham’s Colheita Port. A long term buying strategy also means that the airline has 3.8 million bottles of wines currently stored in its cellar in Burgundy, France to be served in the next seven to 10 years. Coffee and tea are the two most widely consumed beverages on board. Emirates has been serving Dilmah tea across all its cabins for the last 25 years. Over 9.6 million tea bags are used each year with more than 10 tea varieties on offer, including an exclusive blend created for the airline served in First Class called the Emirates Signature Tea. Illy and Nespresso coffee can be found in premium cabins, where espressos and cappuccinos are the most popular requests. Emirates also offers child-friendly meals for its youngest customers and dedicated menus for medical or religious meal requirements which are designed with a team of nutritionists and chefs.